Welcome to Spring! Season for florals, chirping, and cleaning....or in our case - gymnastics, baseball practice, soccer practice, swim lessons, PTO meetings, school volunteering, fit clubs, soccer board meetings, double game Saturdays, playdate, preschool, dance class, rehearsals, recitals, and homework! That is just one week's worth of fun. Most people feel exhausted after reading that list. To be completely honest, I thrive on 'busy.' It drives and motivates me. Those activities are not just tasks, but rather fulfill passions, give purpose, and involve activities with my children. "Busy is a choice." I saw it plastered over an eye-catching background while scrolling Pinterest for preschool snack ideas. Busy is a choice...a good one? Or bad? I get the feeling that "busy" in this case is a negative. My self talk kicks in to justify this quote..."Not bad for us. My kids thrive in activities that offer social stimulation, new friendships, strength and coordination, independence, and confidence." I think whomever plastered that pinnable quote meant to say "Balance is a choice." In everything we do (busy or not), we must find balance. It is often a voluntary decision to find symmetry or you drown. I am a 'giver' in life and I strive to make those around me happy. I enjoy helping. I give and give and give...until there is not much for myself. I have learned that I slowly become weighted down and start sinking as I pour out too much of myself. The revelation is that I HAVE to hold some back...not selfishly, but because it is mandatory to find a happy medium. Balance is definitely a choice...and it will make or break you. You can chauffeur kids around town until you are blue in the face and dizzy. As long as you find the balance for your family, friends, life, and yourself - you are golden. It takes trial and error and some practice. What makes you tick? What inspires you? What makes you dynamic? The answers are what give you the balance to battle against lead weights...they keep you afloat. I help others. I love crafting, sewing, graphics, health, and fitness. All of these mold who I am. After preschool drop-off, I squeeze in a heart pumping, music bumping, sweat pouring workout. It gives me the energy I need to give more of myself. After the kids' bedtime, I pour efforts into craft projects, painting, sewing, graphic design, or building my coaching business. This rejuvenates. Where do you find the balance. Busy can be a conscious choice. 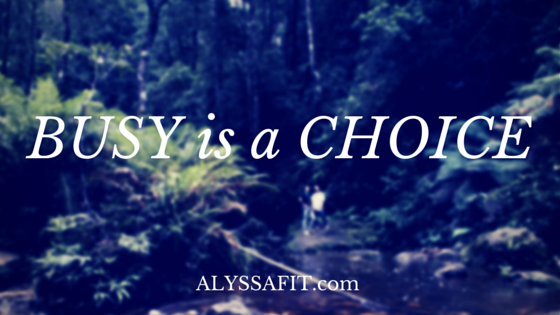 And as long as you find balance in the midst of busy...it is a fantastic choice!